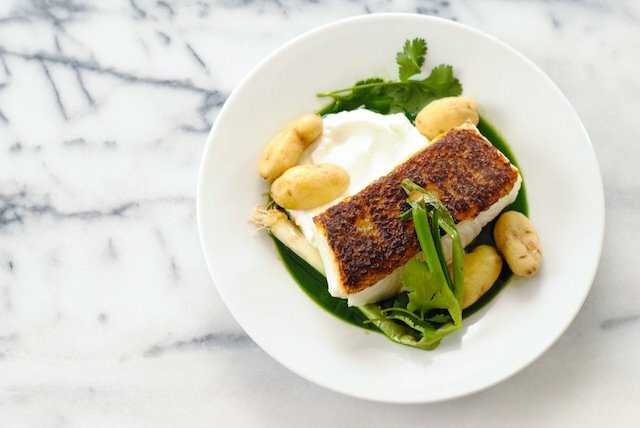 This Seared Chilean Sea Bass recipe with Potatoes & Herb Sauce is a beautiful, healthy restaurant-quality dish that can be made at home in 17 minutes. 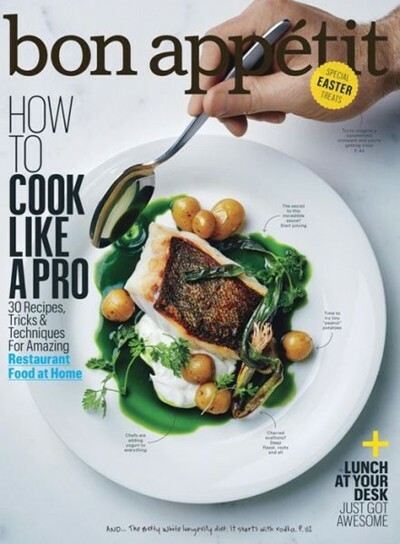 I totally crushed on the cover of Bon Appetit this month. In one image, one headline, one cover, it summed up what I aim to do with this blog – teach people how to cook restaurant-quality food at home. I was already in love with this beautiful plate of healthy food, but when I realized I could pull it all together in less than 20 minutes? Even bigger crush. So I adapted the recipe based on ingredients that were easy to find at my grocery store. 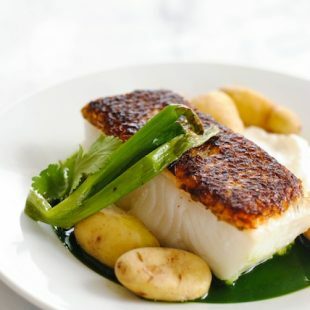 Here’s how you can make this pan seared Chilean sea bass recipe like the home chef that you are. With some shortcuts and tricks to make it even easier. Minutes 1-4: Realize you don’t have a juicer to make the green juice. Shrug your shoulders, pull out your blender, and puree all of the juice ingredients. Dump the resulting herb smoothie into a fine-mesh strainer and set it over a bowl – the green juice drips into the bowl. Success. Home Chef Trick: Work with the equipment you have to make what you need. Minute 5: Get super lazy about boiling potatoes and decide to microwave them instead. Scrub them, put them in a bowl and zap them. Home Chef Trick: Take shortcuts. Sometimes. Minute 6: Get out a skillet and pre-heat it on the stove. Pat the Chilean sea bass dry and season it with salt. Home Chef Tricks: Always start with a screaming hot pan when cooking fish. Always start with dry fish. Always season with salt. Minutes 7 – 13: Place the Chilean sea bass skin-side down in the screaming hot pan. Crispy skin is the best! Turn it and cook it a few minutes longer. While this is happening, get the yogurt out of the fridge and wash and trim your scallions. Home Chef Trick: Don’t just stand around and watch your food cook. Multitask and work on the next step of the recipe, while keeping an eye on the fish in the skillet. Minutes 14 – 17: Transfer Chilean sea bass to a plate to rest, put the scallions in the skillet for a quick char. 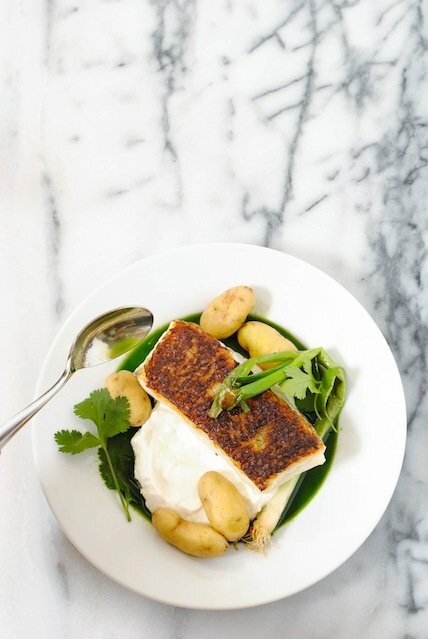 Gather all of the elements and assemble the plates: green juice, potatoes, yogurt, fish and scallions. Go all Picasso on that plate and make it pretty. Home Chef Trick: A beautiful presentation never goes out of style, even at home. 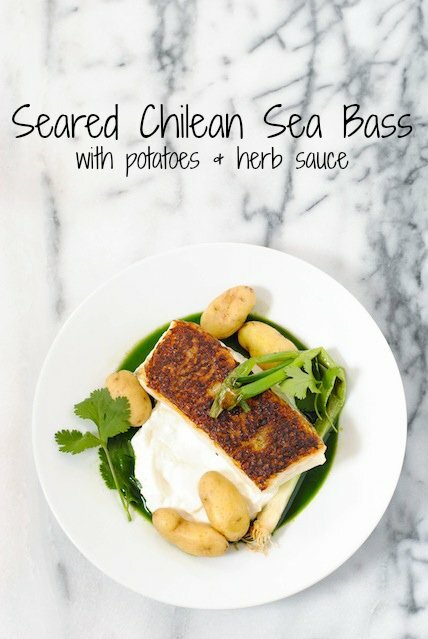 How do you cook Chilean sea bass? How long do you cook Chilean sea bass? For the Chilean sea bass recipe below, I cooked the fish in a skillet for 6 minutes: 4 minutes skin-side down, flip, then an additional 2 minutes. You can also bake the fish in a 400 degree F oven for 10 minutes per inch of thickness of the fish. What temperature to cook Chilean sea bass? No matter how you cook it, you want to make sure that the internal temperature of all fish and seafood reaches 145 degrees F.
What is the best sauce for sea bass? 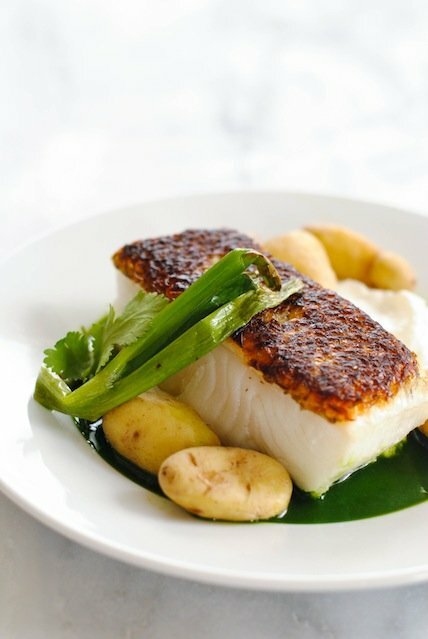 Other great sauce options for Chilean sea bass would be: chimichurri, romesco sauce or lemon cream sauce. Make the Green Sauce: Puree all ingredients in blender until smooth. Pour into a fine-mesh strainer set over a medium bowl. Let sit, stirring mixture in strainer occasionally so all juice drains into bowl; discard solids.